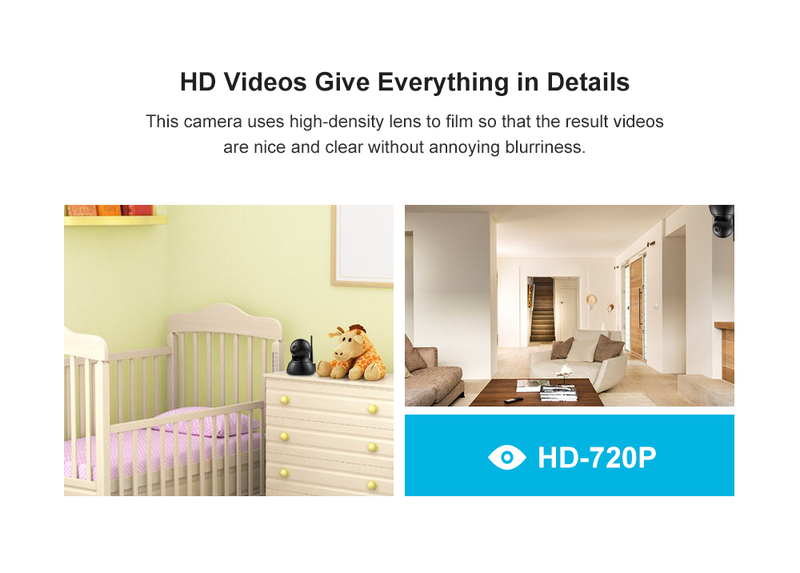 * [720P HD Video] The camera pans and tilts to film seamless 720P HD videos to ease off the stress you might feel when you want to identify what is going on in that very tiny corners. 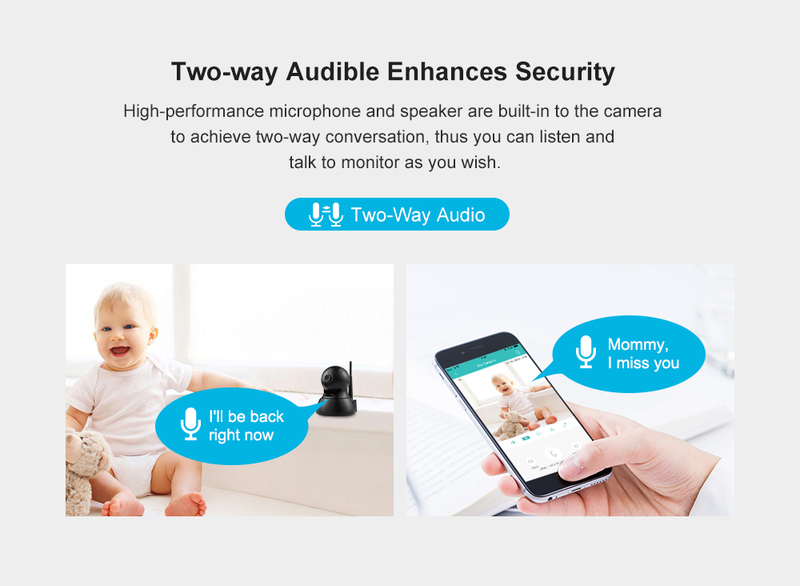 * [Two-way Audio] A high-quality speaker and microphone are installed to the camera to facilitate your surveillance so that you can both listen to the person under monitoring and also talk to him/her. 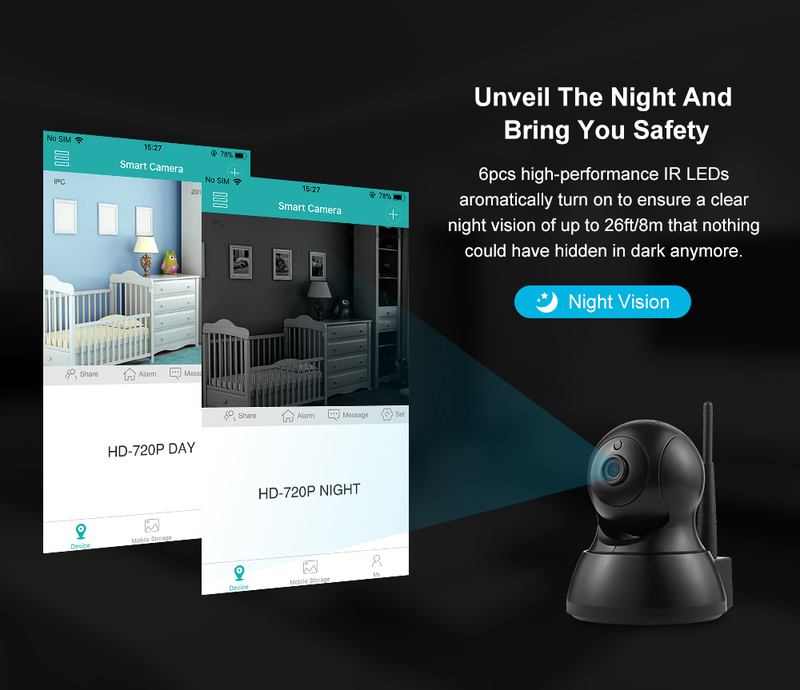 * [Excellent Night Vision] There is no need to explain the benefits of having automatic night vision, but in addition to that, our camera has 6pcs IR LEDs to give outstanding monitoring at night of up to 26ft/8m. 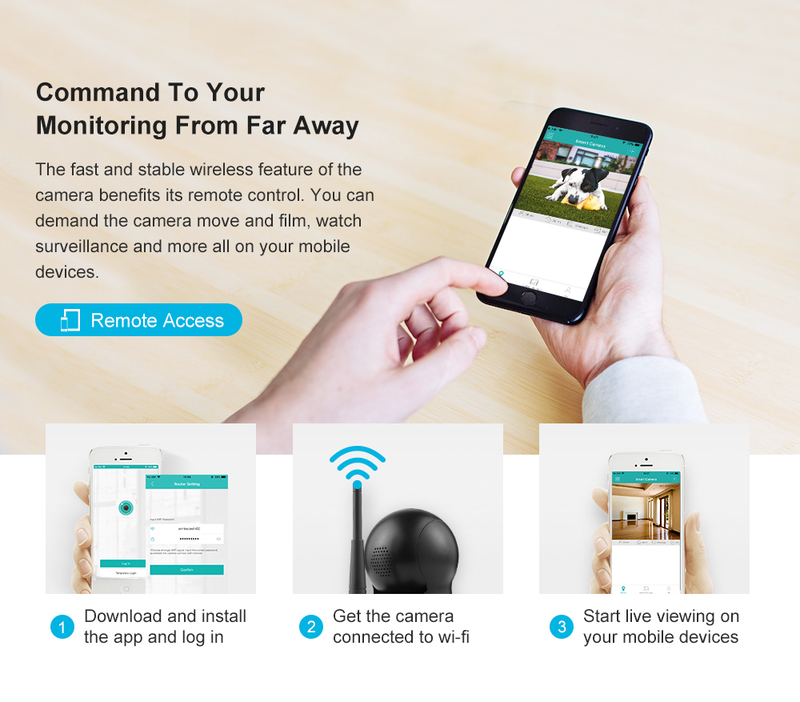 * [Local Recording] It is inevitable to encounter situations where the Wi-Fi is temporarily snapped, or the connection becomes intermittent, you don\'t want your monitoring got interrupted. That is why we provide you a max 64GB on-board recording to make up for it. 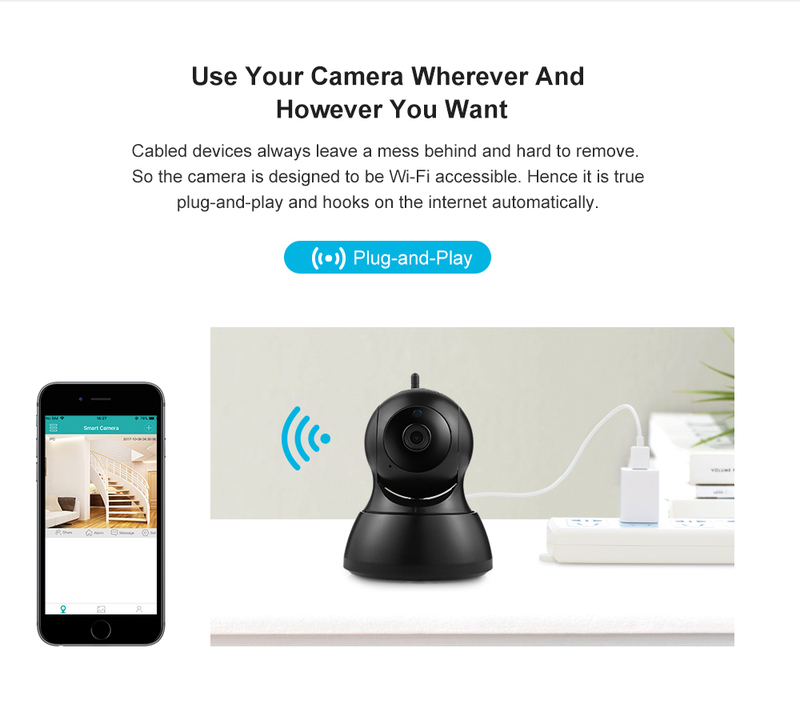 * [Instant Alerts] This plug-and-play security camera makes sure that whenever there is abnormal activity going on, you will receive instant email alerts that allow you to make sufficient precautions. 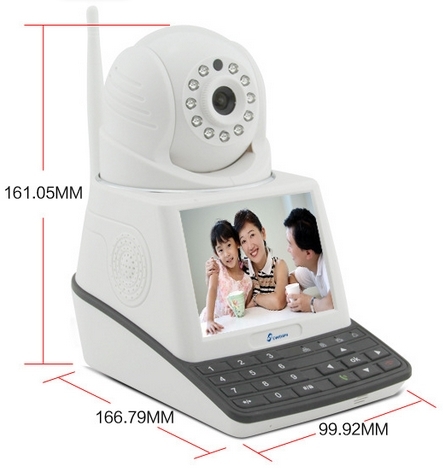 A well-designed surveillance system is a dedicated housekeeper, supervising and reporting everything rigorously. 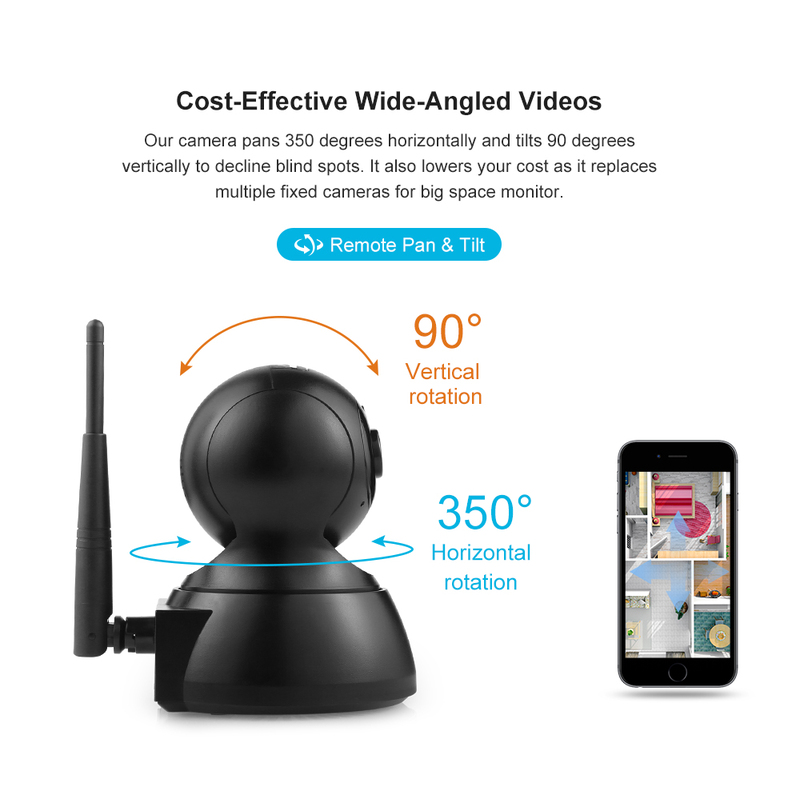 The wide-angled 720P HD videos leave nothing unseen throughout day and night, two-way audio diminishes the space obstruction for you to access truly to the scene from afar. Our SMART PT CAMERA suits a variety of surveillance needs. 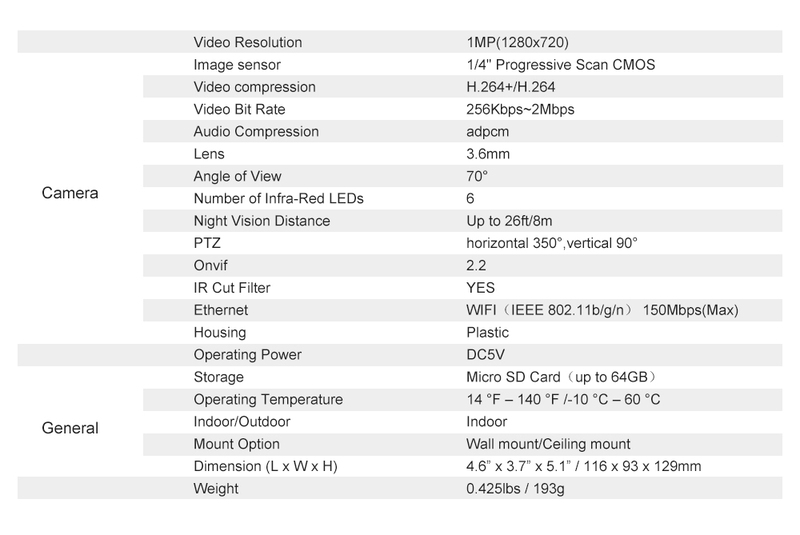 720P Video: Review everything clearly in high-density 720P videos. 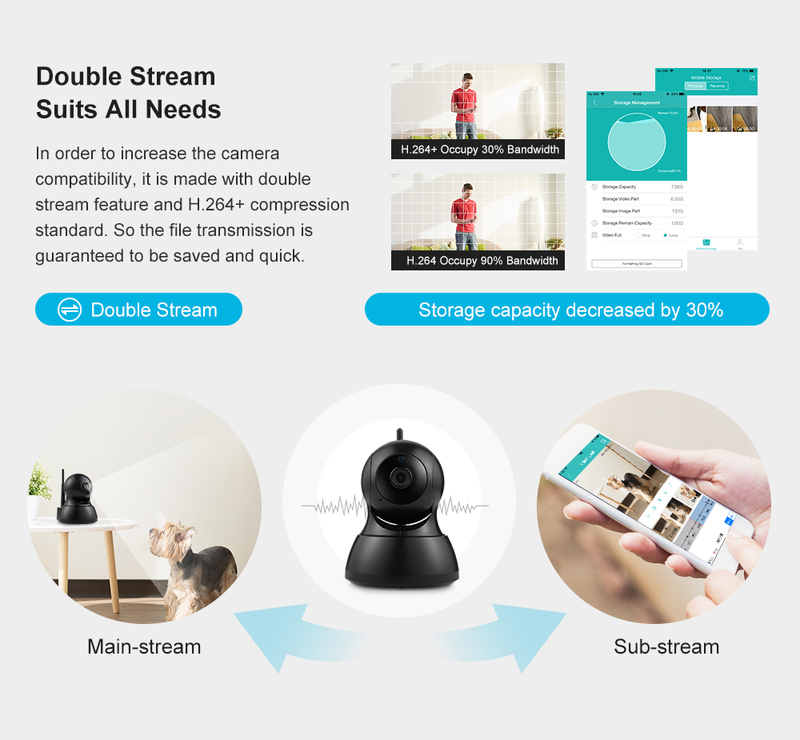 Dual Audible: Talk and listen to the camera to the scenes. 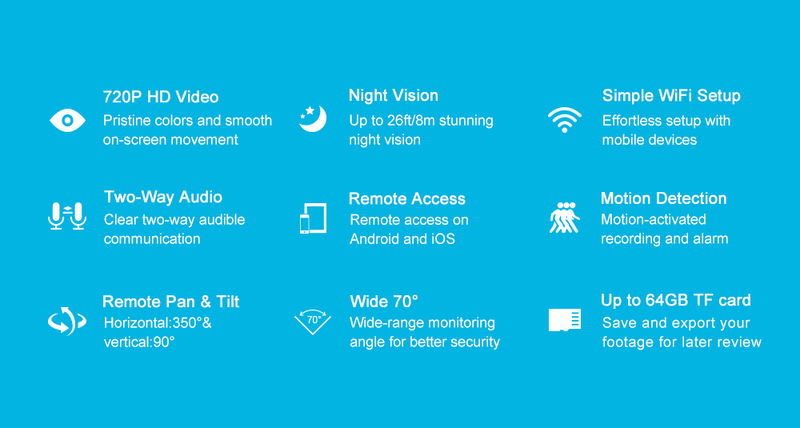 Auto IR: Automatically activated 6pcs IR LEDs spy the night continuously and tightly for you. Wireless Access: Max 150Mbps WiFi transmission rate achieves fast and stable file exchange without cables. On-Board Recording: 64GB local recording makes sure nothing missed but safely stored. Instant Alerts: Email alerts shot out instantly as soon as suspicions detected. Advanced Compression: H.264+ compression gives a faster and better file transmission. Stunning Night Vision: Our camera has an excellent 26ft/8m night vision. Plug-and-Play: The well considerate factory settings straighten the camera application. Our camera is well made with 1280×720P resolution. You can easily find out the details in the corners without having your eyes strained or your back leaned in. Rather than use the standard H.264 we are using H.264+ to provide faster and better file transmission. So that the storage usage is effectively extended. In order to upgrade our security level, we inserted a well-performance speaker and a microphone to the camera so that the user can both talk to and hear from the monitoring areas even from afar. With the purpose of providing great night vision, we assigned 6pcs high-efficiency IR LEDs to our camera to give up to 26ft/8m clear night vision. This PT camera has a wide filming angle of 350 degrees horizontally and 90 degrees vertically. That should cover a good deal of space and clear off blind spots. 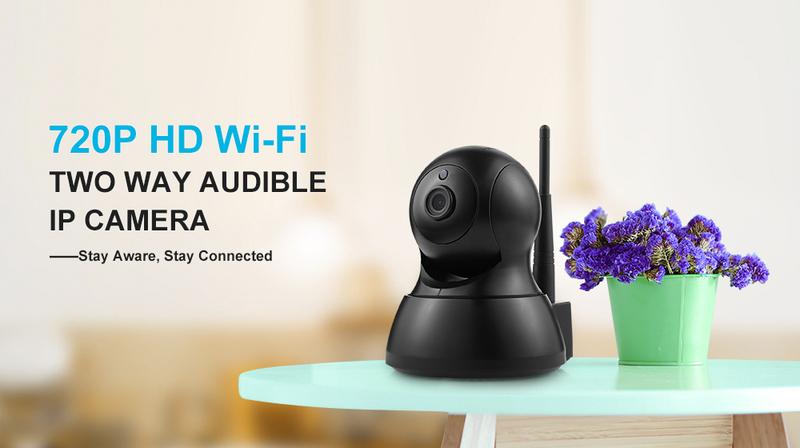 This camera equips with a smart Wi-Fi module that is allowed fast and easy setups, no more tedious steps but click once the internet is hooked. 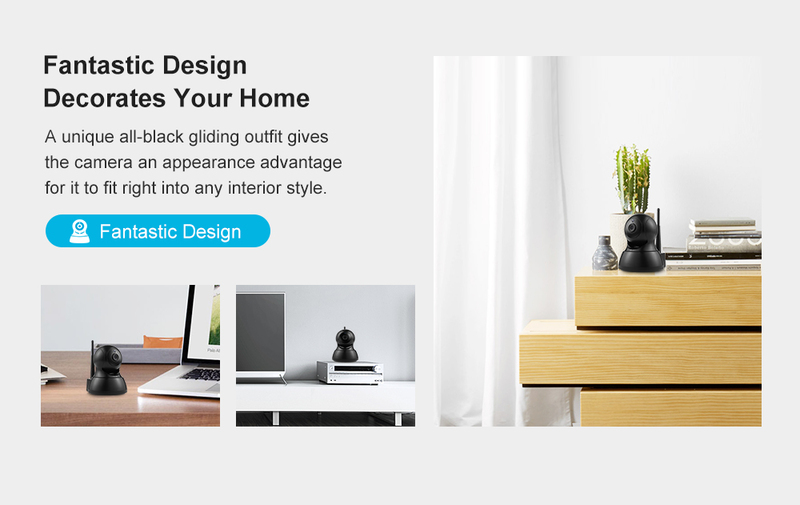 And it also has a uniform all-black appearance that is excellent to blend in various interior styles. 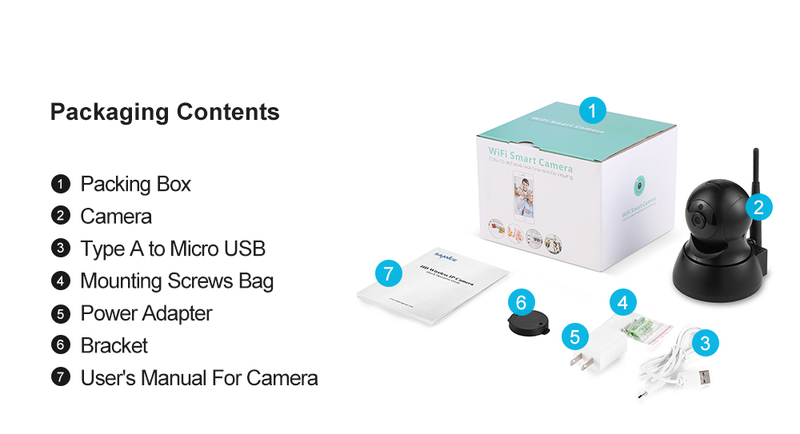 For the sake of safety transmission, we designed a local recording feature to this camera so that with up to 64G TF card storage extension, your footage is insured to be saved even there is network breaks or unstable connection. 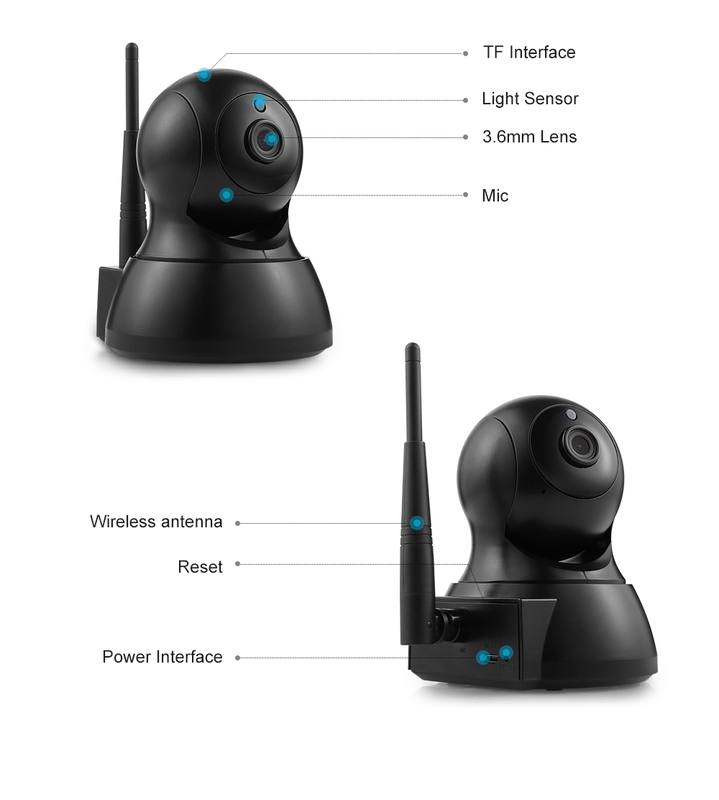 This type of IP camera is new arrive ,the App name is " iCsee",please notice it,if you have any problems with the item please contact us.Thanks for your understanding. 4.If you are US ,EU,AU ,RU customer ,we will consider to delivery the goods from the local United States, UK, CZ, AU or RU. 5.DHL/UPS/TNT/:3-7 working days.EMS:7-14 working days.China Post Mail takes 15-60 working days upon different countries. ANNKE&SANNCE is not responsible for those charges.